Thanks for watching the Sapsucker Woods Great Blue Herons during the 2012-2013 breeding seasons. Although the herons are no longer nesting in Sapsucker Woods, you can still see them from time to time foraging on our Sapsucker Woods Pond Cam. We are still working on a new cam solution for the pond this Spring. A single heron (the male from past years) has been hanging around on the pond and foraging, but no nesting behavior has been observed. Possibly by the end of this week, we'll have a new live feed up and running. Stay tuned! 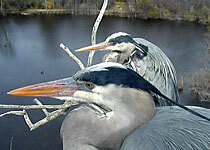 Herons are spending more time in the cam tree and around the pond. Maybe one will nest soon? Check out this clip, can you see a missing back toe on the right foot? Dad, the heron that has nested on the pond in previous years, is missing a toe, and we think this might be him. He may have spent the winter down south, possibly in Florida and now he has returned, hopefully to start a new family at Sapsucker Woods Pond. Another heron is seen on Sapsucker Woods Pond. The adult is not identified as 'Dad' as it has all its toes present. Dad is missing a toe on the right foot. Last Sighting of a Great Blue Heron this Year? Could we have seen our last sighting of a Great Blue Heron on Sapsucker Woods Pond for the rest of the year? Check out the highlight clip for more information. Did 'Dad' Heron Breed Successfully After All? 'Dad', a second adult and a juvenile were seen on the pond in the morning. The juvenile landed in the same tree as Dad for a short time, then flew close to the second adult. Could this have been two parents and their offspring? Dad may well have bred successfully elsewhere this year. It would explain his great fishing efforts over the 2014 season. Perhaps he was taking the fish away to young on a nest nearby. There are several ponds to the North of Sapsucker Woods, he could have established a new nest site after the loss of the nest on the pond at the Cornell Lab. Great Blue Herons nest mainly in trees, but will also nest on the ground, on bushes, in mangroves, and on structures such as duck blinds, channel markers, or artificial nest platforms. Males arrive at the colony and settle on nest sites; from there, they court passing females. Colonies can consist of 500 or more individual nests, with multiple nests per tree built 100 or more feet off the ground. Male Great Blue Herons collect much of the nest material, gathering sticks from the ground and nearby shrubs and trees, and from unguarded and abandoned nests, and presenting them to the female. She weaves a platform and a saucer-shaped nest cup, lining it with pine needles, moss, reeds, dry grass, mangrove leaves, or small twigs. Nest building can take from 3 days up to 2 weeks; the finished nest can range from a simple platform measuring 20 inches across to more elaborate structures used over multiple years, reaching 4 feet across and nearly 3.5 feet deep. Ground-nesting herons use vegetation such as salt grass to form the nest. Pale blue, fading slightly with age. Bluish eyes open, chick covered in pale gray down, able to vocalize. Great Blue Herons eat nearly anything within striking distance, including fish, amphibians, reptiles, small mammals, insects, and other birds. They grab smaller prey in their strong mandibles or use their dagger-like bills to impale larger fish, often shaking them to break or relax the sharp spines before gulping them down. Though neither bird is banded, you can identify the male by the absence of a hallux (the rear-facing toe) on his right foot. Adult herons can be up to 4.5 feet tall, with a wingspan that ranges up to 6 feet. Despite their large size, they typically only weigh around 5 pounds. 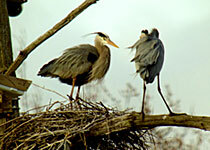 Herons usually lay 2-4 eggs and share incubation duties for 25-30 days. Incubation begins with the first egg, and the young hatch asynchronously (not at the same time) over 2-5 days. After hatching, it’ll take 7-8 weeks before they fly from the nest for the first time. This Great Blue Heron nest is in a giant white-oak snag in the middle of Sapsucker Woods pond (click for aerial view), right outside the Cornell Lab’s Johnson Center for Birds and Biodiversity in Sapsucker Woods. In 2009, the arrival of those first twigs marked the start of the first known Great Blue Heron nest in the history of Sapsucker Woods. Early in the spring of 2012 we installed two cameras to bring the hidden world of their nesting habits into full view. The nest itself is nearly four feet across and a foot deep, and wraps almost entirely around the trunk of the tree. The birds have slowly built up the nest over the last few years. Sapsucker Woods Sanctuary was named in 1909 by famed bird artist Louis Agassiz Fuertes upon finding the first Yellow-bellied Sapsucker nest in the Ithaca region. About 3 miles from Cornell’s campus, Sapsucker Woods covers 230 acres of forest dominated by red maples, beech, and hickory, including the 10-acre pond that hosts the herons’ nest site.